Crescenta Valley Soccer Club is committed to the promotion of development of youth in our community through their participation in soccer. We are a non-profit 501c3, that is committed to providing all our members with the opportunity to develop athletically and personally in a positive, supportive, and safe environment. The Crescenta Valley Soccer Club encourages and promotes ethical and moral behavior, good sportsmanship, community involvement and good citizenship. 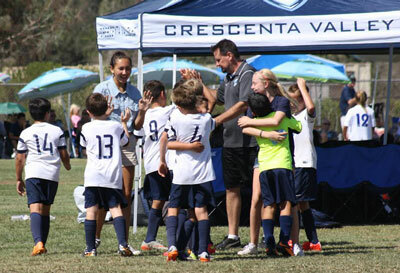 Crescenta Valley Soccer Club is recognized as the Premier Soccer Club in Southern California. Every player recognizes the commitment of the club to provide him or her the best coaching available, the best fields possible, and highest level of competition obtainable. Every parent acknowledges the commitment of the club to develop their son/daughter into the best person they can be, both on and off the field, by providing accessible, well-organized games, practices, and community events, which are communicated in a timely manner. Every coach understands that their main goal is to develop the players both athletically and socially, by providing expert coaching and acting as a role model in all aspects of life.